​Drain problems don’t happen at the most convenient of times. Whether it’s tree roots in the main sewer line, a backed-up floor drain, a kitchen sink not draining, garbage disposal not working properly, or maybe a slow drain, the Drain Plumber can fix it. If you have a drain problem but are not sure what it is, our experts can find exactly what is going on. In the bathroom there are many drains, including the sink, bathtub, shower, and toilet. If one of these drains are backed up, then it is likely a much simpler problem than if all of these fixtures are backed up. For example, if just the shower is backed up it could be as simple as some hair down the drain. If dark, dirty water is coming up in the shower and or bathtub drain, the problem is likely farther down the line. No matter where the clog is, our experts can resolve the problem. Sewer line issues? It’s hard to know what is going on in the sewer line without a camera inspection. It could be tree roots, perhaps something was flushed down the toilet that shouldn’t have been flushed down the toilet. It could even be what know one likes to hear, a broken sewer line. 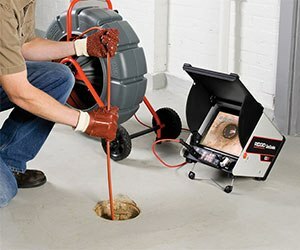 Whatever the problem is, a sewer line inspection will take out the guess work. With the combination of a camera and a locating device we will know what and where the issue is. If you are in the process of buying a house that is build prior to 1980, I recommend a sewer line inspection. Read more here. ​A clogged toilet can be very frustrating. If the plunger isn’t working, let our technicians take over, we have the proper equipment and experience to get the toilet flowing again. Never put drain cleaner down the toilet, as it will dissolve the wax ring at the base of the toilet. Are you tired of waking up in the middle of the night to the sound of running water just to find you have to jiggle the toilet handle? Or perhaps there is another issue with your toilet. Give us a call. Does your garbage disposal smell? Here is a simple solution. Run hot water in the kitchen sink and turn on the garbage disposal. Add Dawn dish soap (Dawn breaks up grease) while the water and disposal are running, not too much soap a little goes a long way. Repeat as needed. Always run water when the garbage disposal is running. Read more here.